Water Heater Repair Gibbon MN | Drain and Sewer Services Gibbon MN	| GSM, Inc. The plumbing system in your home is made up of some of the most important parts in providing comfort and making life easy for you and your family. Unexpected plumbing issues can happen at any time and when they do you want them taken care of right away, so life can get back to normal. So, when your bathroom faucet starts leaking or water heater goes on the fritz, who do you call for help? If you live in the Gibbon, New Ulm or St. Peter area, GSM Plumbing and Drain provides the timely, affordable, and effective plumbing repairs you need to get things flowing smoothly again. Countless plumbing problems can waste your money and inconvenience you at the worst possible times. Fortunately, the experienced plumbers at GSM can handle any plumbing repair you require. Looking to update your bathroom to create an elegant bath retreat, tired of soaking up water in your basement and need a new sump pump installed, you’ve heard about tankless water heaters and want to learn more? We can help you! Our professional estimators take the time to listen to you and evaluate your home before providing a detailed proposal, often suggesting several alternatives that will deliver the comfort your family deserves while maximizing your budget. We are committed to plumbing excellence in every job we perform. Do you need to replace or repair you water heater? Call GSM today, we can help you! That huge tank in your house or that tankless unit on the wall is always ready to supply hot water to your dishwasher, laundry, and faucets. You often don’t think about this appliance until something goes wrong. We know how inconvenient it is to be without hot water. 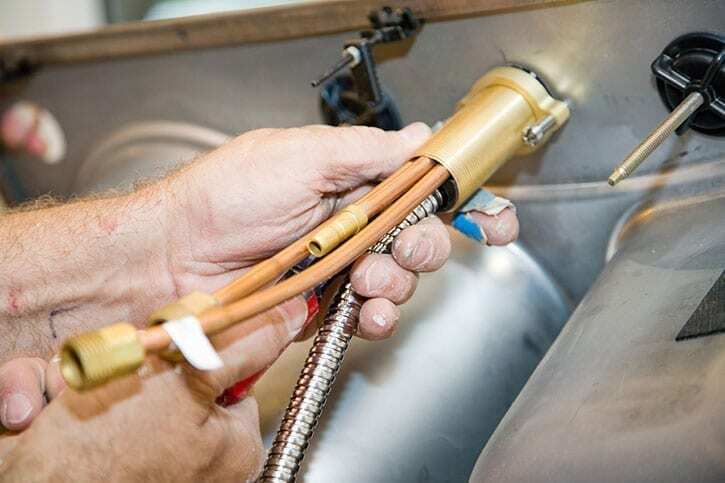 GSM will provide fast, efficient, water heater repairs and/or replacements. Need a boiler repaired, serviced or replaced? We can help you! Our professional estimators take the time to listen to you and evaluate your home before providing a detailed proposal, often suggesting several alternatives that will deliver the comfort your family deserves while maximizing your budget. We are committed to plumbing excellence in every job we perform. The extreme cold creates a substantial risk for frozen pipes that can then burst. Freezing water turns to ice within the pipe, which in turn can expand and block the line. This blockage can create excessive pressure throughout the system and cause pipe failure no matter if the pipe is made of plastic, copper or steel. Even a tiny crack can lead to the unleashing of more than 250 gallons of water in a single day. The results of frozen water pipes can cause property damage and costly repairs. GSM has been providing quality service across southern Minnesota since 1904. In 2013, the company began to expand into the plumbing industry when it acquired Isakson’s Plumbing and soon after purchased Schanus Plumbing & Heating. GSM has since become a trusted source for expert plumbing services.